"This is one very, very important step to get coal back on its feet and stop the hemorrhaging of jobs that we've seen"
–National Mining Association spokesman Luke Popovich, regarding the recent Congressional vote to allow the dumping of coal mining waste in streams. Story at Reuters, background on the issue at Vox. In reality, environmental regulation is a small contributor to the loss of coal mining jobs, with the primary cause being the abundance of cheap natural gas. Monday, Feb. 13, 5:30 pm, Oak Bluffs Library. A pre-public hearing meeting of the MV Commission's Land Use Planning Committee (LUPC) to discuss the proposed expansion of athletic facilities at the high school, including the installation of one or more artificial turf playing fields. The LUPC is unlikely to accept public commentary during the meeting itself. VCS encourages concerned citizens to submit written testimony in advance (via email or to the address below) and/or to attend the meeting to learn more and to signal to the committee that the issue is of broad public interest. The proposed project raises numerous environmental concerns (explained in the letter we submitted encouraging the MVC to review the project). The most straightforward of these is simply the required periodic disposal of a plastic carpet the size of a football field, a visceral disappointment in light of recent progress in reducing plastic waste Island-wide. 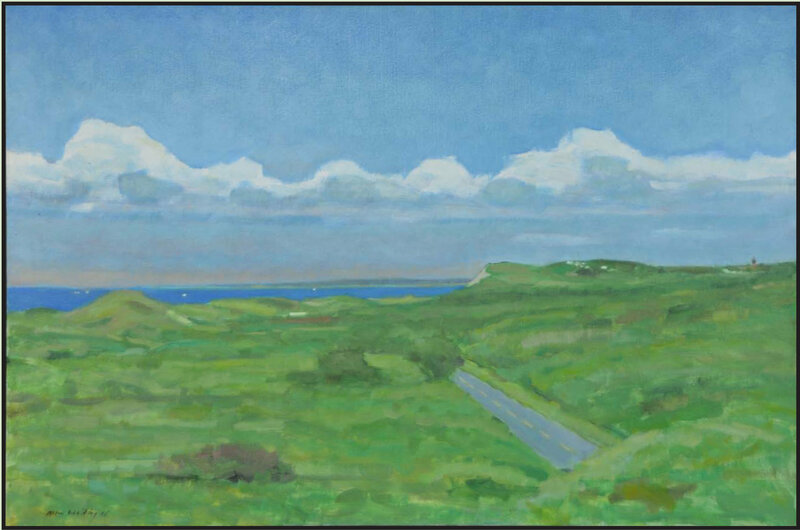 Wednesday, Feb. 8, 5:00 - 7:30 pm, Aquinnah. A new, mixed gender fire circle at Sassafras focused on reconnecting with nature, sharing, and community building in a world facing challenging times. Donations accepted, more info at website, or call (508) 645-2008. Saturday, Feb. 11, 10:00 to 11:00 am, West Tisbury. Saturday, Feb. 11, 4:00 pm, Edgartown. The Harbor View Hotel hosts a free series of talks and discussions featuring the MV Shellfish Group and others. For a list of topics or to purchase tickets for the benefit dinner to follow, see MVSG website. Sunday, Feb. 19, 4:00 pm, Edgartown. 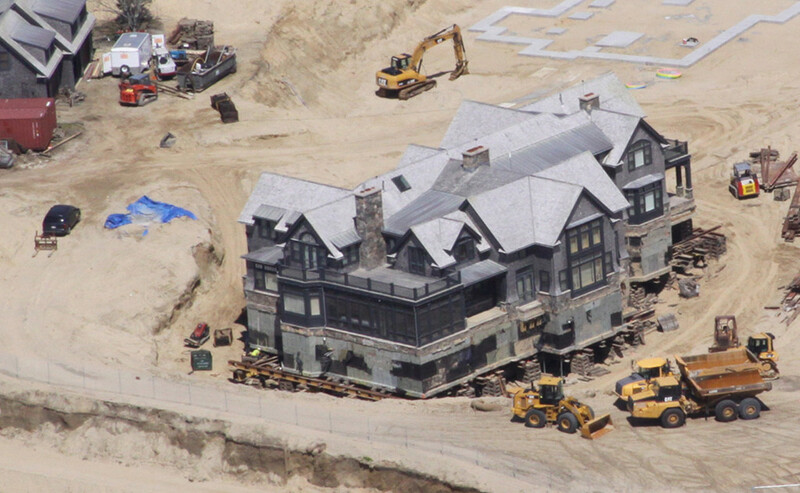 Documentary film One Big Home, an exploration of the issues – economic, cultural, and personal – surrounding the proliferation of huge houses on Martha's Vineyard, is now showing every other Sunday at Edgartown Cinemas. The heathlands of Moshup Trail in summer, painted en plein air by Allen Whiting for the VCS 50th anniversary event. It’s been over five years since our last guided hike around the moors, beaches, and heathlands of Moshup Trail in Aquinnah. Although this little patch of the globally rare (and declining) coastal heathland habitat looks much the same as it did then, it has been an eventful five years. Our long-running legal defense work first received a significant setback at the State Appeals Court, but then a larger victory before the Mass. Supreme Judicial Court (ultimately made secure when the US Supreme Court declined to review that decision). In between those decisions came the beginning of a new program to monitor and improve habitat for a threatened orchid species. Sometimes, it takes a lot of work just to keep things as-is. So when we return this Sunday (Feb. 12) to Moshup Trail, it will be for a Winter Walk that is truly close to the heart of VCS – and symbolic of our unique role in non-profit conservation legal defense. The Moshup Trail Sanctuary was originally created through the combined efforts of non-profits, government entities, and private citizens using the standard tools of conservation: donations of land, recording of conservation restrictions, and where possible, outright purchase of parcels. However, when opportunistic developers sued VCS and others to force an easement across the Sanctuary to build an access road, legal defense took on an essential role: protecting rare habitat, already conserved, from fragmentation and degradation. The story of conservation at Moshup Trail is at once both inspirational and cautionary. With the national political climate turning sharply against environmental protection (see "Quote of the Week" at left), legal defense – and more broadly, safeguarding those gains already made – will be of increasing importance to the conservation movement. Please continue to act in whatever way you are able to help us protect our natural environment, such as through financial support of VCS and our colleague non-profits, support of maintaining public funding of the Land Bank, attending and/or submitting testimony to public hearings, and by writing your representatives. Sunday’s walk begins at 1:00 and is expected to last a little over an hour, followed by cider and cookies. For parking, proceed down Moshup Trail 1.3 miles from the down-Island end and look for VCS signs on the left. This Thursday, our winter film series on waste reduction – Resolution 2017: Make Less Waste – resumes with a special event. “Life Without a Trash Can” will feature an excellent collection of speakers: three in person, and three via the TED Talks video series. 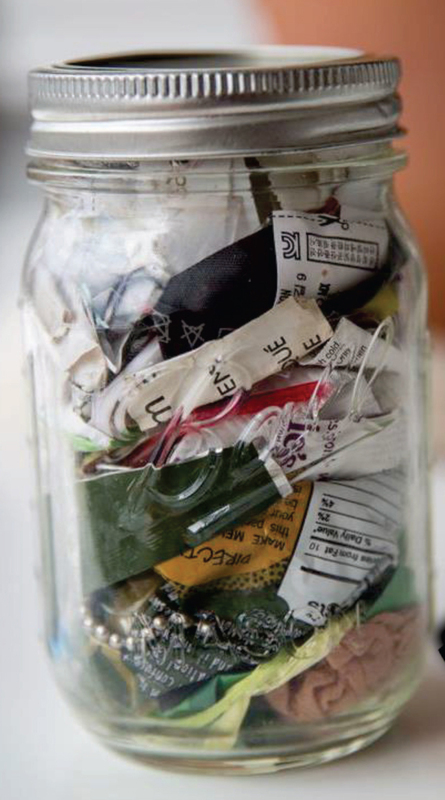 Together, they will share what it’s like to truly live without trash, and what smaller steps we mere mortals can take to move just a little closer to the “Zero Waste” lifestyle. Local cookbook author Sarah Waldman will demystify popular snacks so that anyone can create them, bringing kids into the excitement of cooking while learning a bit about where our food really comes from – all while avoiding the excessive packaging of the store-bought counterparts. (Yes, you can make potato chips at home!) 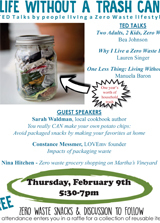 In addition, Nina Hitchen and Constance Messmer will lead a discussion about food packaging options and share their experiences with Zero Waste grocery shopping here on our Island. The event is this Thursday (Feb. 9) from 5:30 to 7 pm at the Oak Bluffs Library – and it's free! So come on out, enjoy some homemade Zero Waste snacks, learn about reducing your own waste footprint, and be entered for a chance to win a fabulous collection of reusable gear! 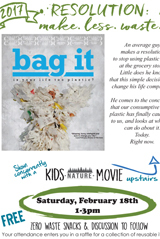 For more details, and a preview of the 4th part of the series – the Feb. 18 screening of Bag It – click the posters below.